Reach4thealps is owned and run by Gina and Marcus Ewart. Both from Scotland, they were lucky enough to learn to ski as kids in Glenshee (Gina) and Cairngorms (Marcus) and still to this day argue over which resort is best! Gina did a ski season in Chamonix cooking when she was 20 and caught the ski bug and love for the mountains. While they both had “proper” jobs they always missed the mountains and continually talked about moving to the Alps. 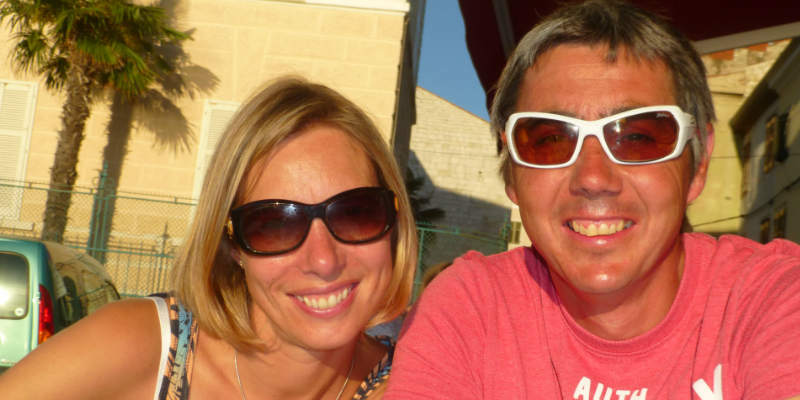 They ended up working their first season together in Morzine and fell in love with the Portes Du Soleil area. The company name was dreamed up in All Bar one in Leicester Square, London with a group of friends and Reach4thealps was launched in summer 2002. They welcomed the first guests to Chalet Sol Re in December 2002 after lots of DIY, curtain making and trips to Ikea! 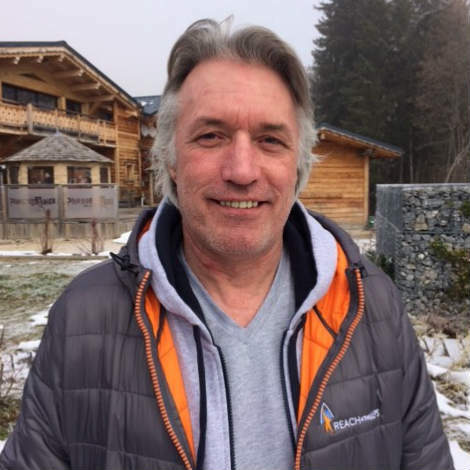 They successfully ran Chalet Sol Re for 2 years and then started to expand little by little and in the 10 years since have grown to having a portfolio of 9 catered and 8 self-catered properties between Morzine and Les Gets. In between all that they somehow managed to fit in getting married and having 2 kids in the process! Jane took a sabbatical from a professional career and headed off on a once in a lifetime trip around the world. After many months of adventure, Jane finished her trip with a winter season chalet hosting in Chalet Martinet. During this time Gina & Marcus had their 2nd baby and were running out of hands! Jane suggested that maybe they should hire a Resort Manager (she had someone great in mind!) and the rest, as they say, is history. 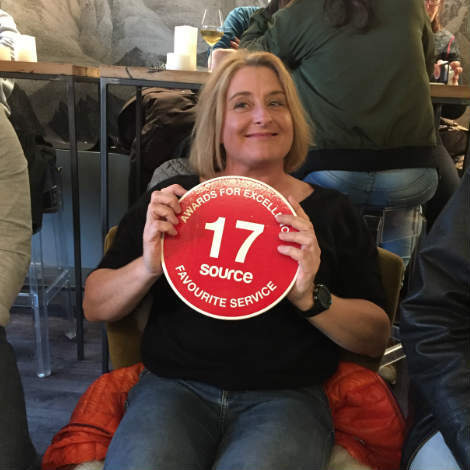 10 years on, Jane handles everything from logistics to the end of year accounts and makes sure everyone is in the right place at the right time, including Gina & Marcus! 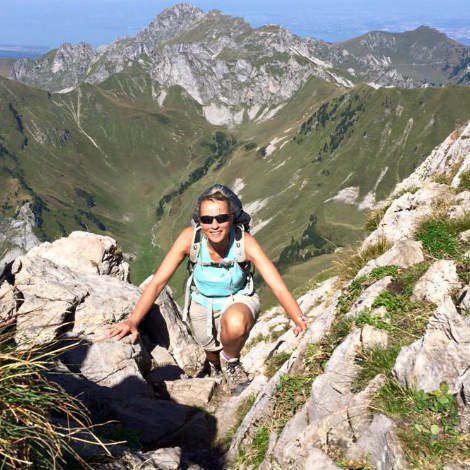 In summer, Jane enjoys hiking, road biking, mountain biking, swimming & running! Sian has been a member of the Reach4thealps team on and off for the last few years and we’re thrilled to say she’s coming back this winter! In the past she’s been a host but now she looks after the day to day running of the chalets during winter as our Chalet Manager. 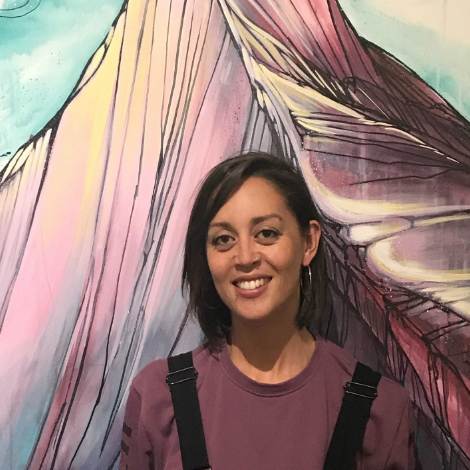 Sian is a professional swimming coach and has even swam the channel so as you can imagine she’s got heaps of energy and enthusiasm! She’s also a great cook! We know the chalets are in safe hands with her. 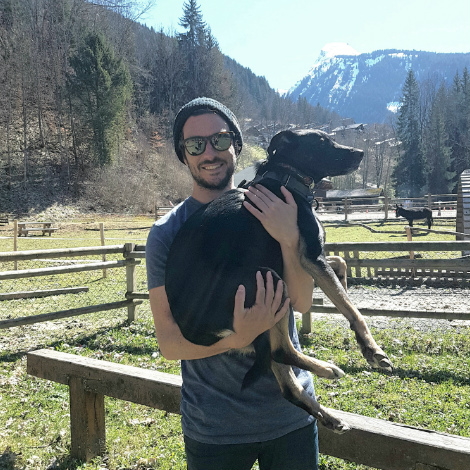 Josh spent three years in Morzine over 10 years ago so he already has a good understanding of the local mountain and the surrounding areas. After spending 8 years in a number of different jobs, including account mamanger for a leading bicycle brand, Josh decided he wanted to fulfill his dream of living in the mountains again. 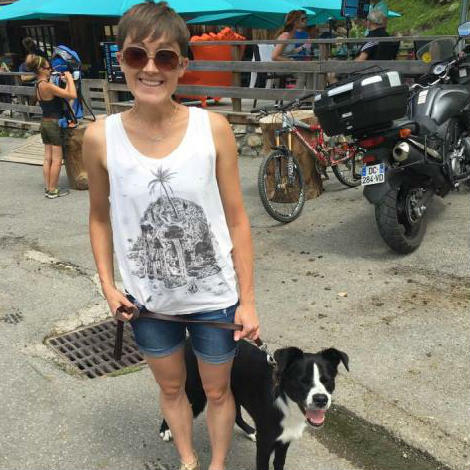 He now enjoys his life in Morzine with his fiancee Clare and their rescue dog, Minnie. Josh is an avid snowboarder so you will most likely see him on the mountain on his days off. In the summer he will be looking forward to long hikes with his dog, mountain biking and dusting off the cob webs from his golf clubs. Alice took a career break from working as a BBC Journalist in Manchester and never looked back. After spending a year in the mountains, her and her partner Brian, decided that this was the place for them. 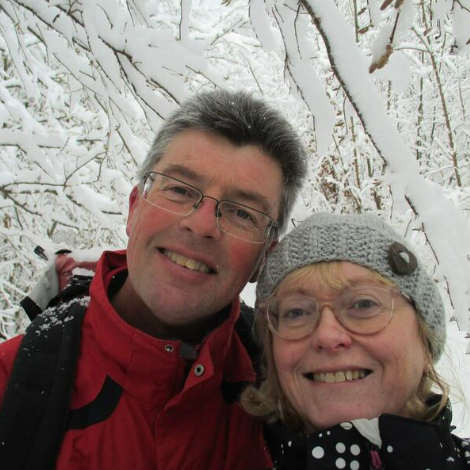 They now enjoy life in Morzine with their dog, Vince and their cats Alfie and Kipper. They also share their home with a hoard of bikes, boards, skis and trail running shoes! Alice has joined the Reach team on the sales and marketing side of things so you’re likely to speak to her at some point. Morzine is a million miles away from Manchester however Alice is loving every minute of the mountains! Having travelled to a wide range of places including South America, Vietnam, Mexico and the Caribbean, Sam and Lizzie thought it was time to switch out the hot for the cold. With 15 years Ski experience between them and a deep love for French culture, it was an obvious choice to join Reach for the Alps. They’ll be taking full advantage of the activities in the Portes Du Soleil including Dog Sledding, Helicopter Rides and the Aquariaz Water Park! 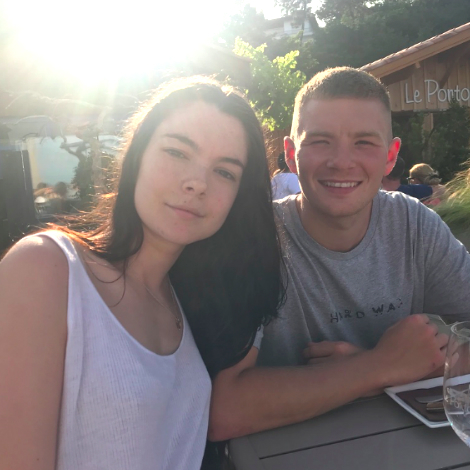 Callum and Phoebe are both from Belfast and have skied/snowboarded from a young age, over time becoming their favorite past time when possible. 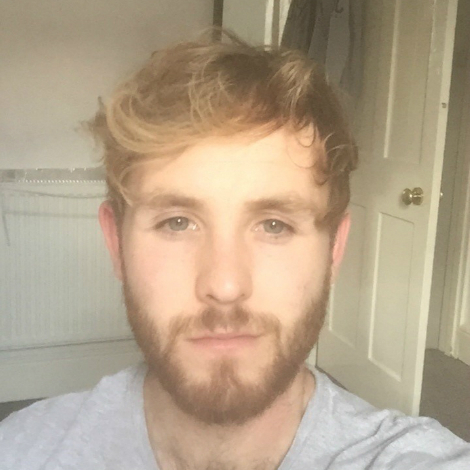 After graduating from universities in Belfast and London studying management and Finance, Callum spent the winter Snowboarding in Japan whilst Phoebe pursued her career but both have decided that they they cant keep away from the mountains and the Mournes aren’t cutting it any longer. They’re both thrilled and excited to have the opportunity to host the Brown Bear Lodge, and are looking forward to a great winter season. Nickie decided she would like to swap the walls of a classroom for the mountains and snow this winter. A keen traveller and outdoor enthusiast Nickie has explored many countries and participated in a wide range of activities. She is always up for a new challenge; some of her most exciting adventures have been sailing round the world, cycling Lands End to Cape Wrath, swimming between the Scilly Isles and nursing in Uganda. 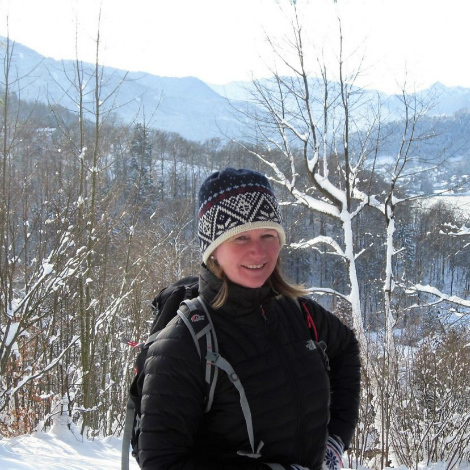 Nickie has shared her passion of skiing and adventure with numerous children having introduced skiing trips and Forest School to the curriculum in her school alongside helping train older pupils for their Duke of Edinburgh awards. 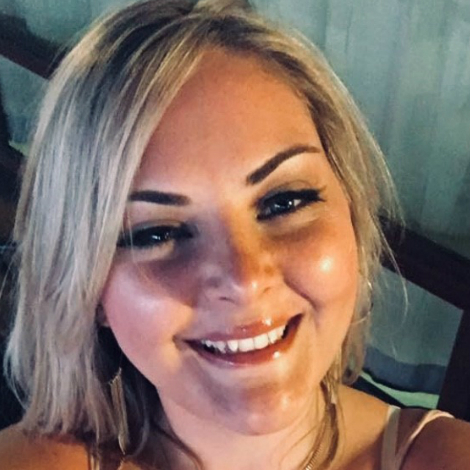 In her spare time Nickie has always enjoyed cooking for and entertaining friends and is looking forward to putting her culinary and hosting skills into action as a Chalet Host. She is excited at the prospect of meeting new and interesting people whilst having the opportunity to improve her skiing. 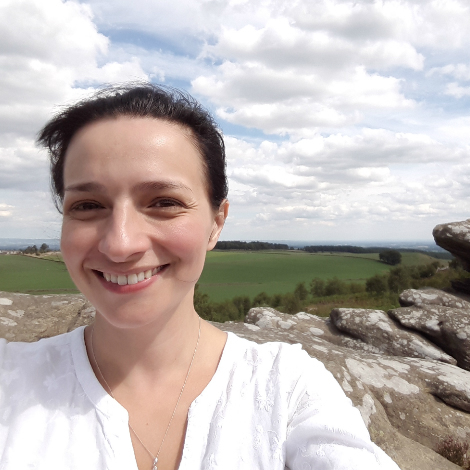 Judith has been managing a pharmacy on the edge of the Yorkshire Dales for the last few years, enjoying orienteering and Ashtanga yoga. In search of a new challenge and a more dramatic backdrop to her outdoor activities she is heading to the alps. She honed her culinary skills at Ballymaloe cookery school in rural Ireland. She is looking forward to treating her guests to fabulous food and hospitality, whilst continuing on her quest to master the perfect Tiramisu and enjoying the slopes! A bit about myself – I have been working for Essex Police for the last 18 years and fancied a bit of a change of scenery (to say the least!) and decided to do a winter season in Morzine. 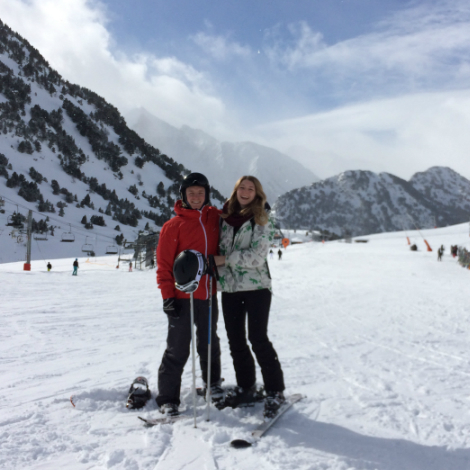 I have skied for 20 odd years – having been introduced to the sport by my Step-Dad. I have skied all over Europe and North America, mainly with my sister and we have been to Morzine many times in both the summer and winter, so know the area really well. I’m going to be living in Morzine with my 2 dogs Billie and Daisy, plus my cat Madge, and hope to fit in some good walking as well as skiing. I used to play ice hockey for Chelmsford many years ago. 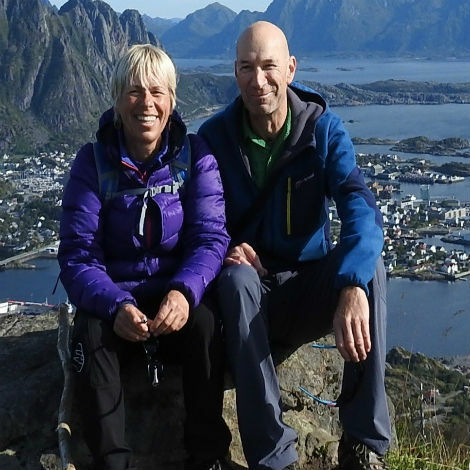 Helen and Phil have always loved the mountains and a few years ago gave up professional careers, a 9-5 lifestyle and followed their dream of working in the mountains and doing a ski season. They’re now addicted! 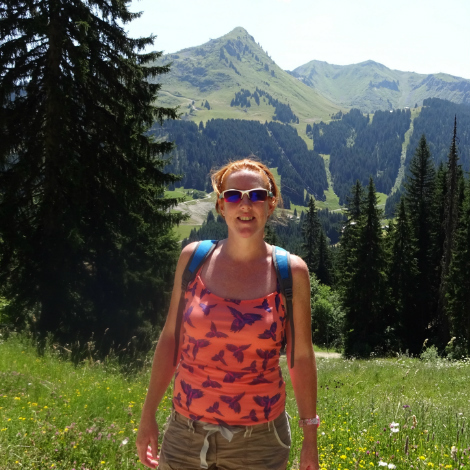 After 3 seasons in La Tania, 3 Valleys & last year in Morzine for us at Chalet Claire Vallee. This year we are delighted that they are returning to Claire Vallee. When they are not creating culinary delights for our guests you’ll find them up the mountain on skis or on foot. Their summers see them working as campsite wardens in the UK and in their time off between seasons they love to go traveling – for 2018 it’s New Zealand! 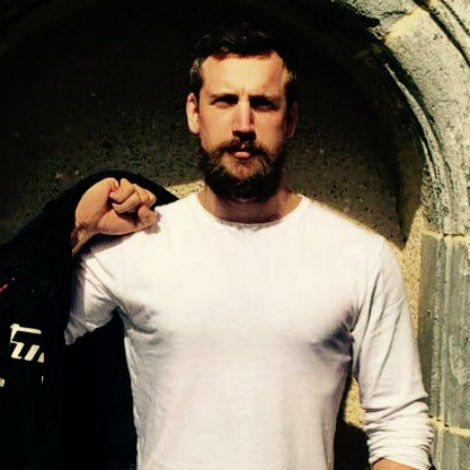 Harry has been working in the building trade since leaving school at age 16. He left the UK at age 20 to go spend some time in France and experience a different lifestyle. During his time there he was eventually drawn towards the Alps and found himself a winter job as a maintenance technician/ Driver. After a year and a half working back in England he feels once again drawn to the mountains and season lifestyle and getting back on his snowboard. 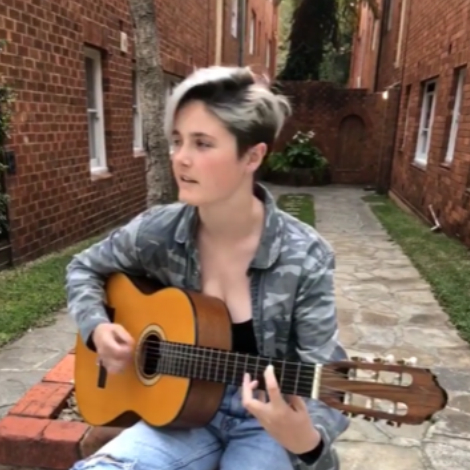 Matilda is new to the reach4thealps team this year but usually spends australian summer taking small bus tour groups of people around Sydney where she is originally from. 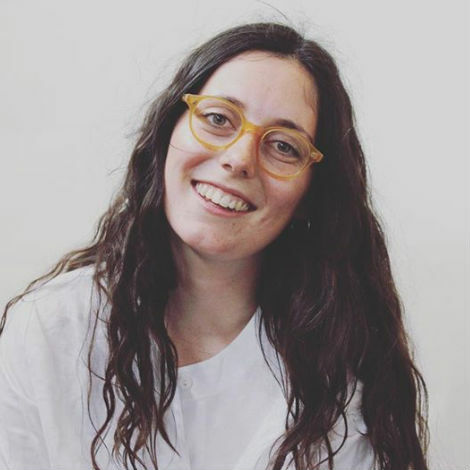 Matilda has also spent 3 years living in Barcelona running electric bike tours. This year she has decided to have a cool change to join us in the alps to see a new area of the tourism industry whilst also squeezing in some skiing at the same time. After finishing his degree in Sport and Exercise Science, Alex’s dream of working in the mountains with his girlfriend Afrodyta, finally becomes a reality. A family holiday over 12 years ago with Reach For The Alps initiated Alex’s love of the mountains. Since then, Alex has taken any opportunity to go back and snowboard. During the summer, Alex is a competitive road cyclist. After also finishing her degree in Sport and Exercise Science, Afrodyta and Alex decided they wanted to do something a bit different to their university compatriots. After spending some time snowboarding in Poland a year ago, she immediately wanted to spend more time on the mountain and improve her skills. Harry likes snow. Harry likes mountains. Harry loves snowy mountains. Yet, he’s spent the last few years living in places not particularly renowned for their topographical extremes or dreamy white precipitation. Still, life hasn’t been too bad. He lived in China for a while – that was fun. He lived in London too. Studied Social Anthropology. Worked for a few different human rights charities…. One day, however, sitting in his tiny London apartment he heard the feint but certain call of a season in the French Alps. 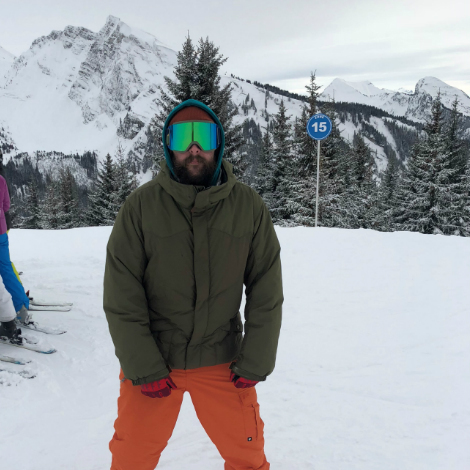 He answered that call… and now he’s spending his Winter hosting folks with a shared love of those snowy mountains, and carving up the slopes throughout Portes-du-Soleil in his spare time. 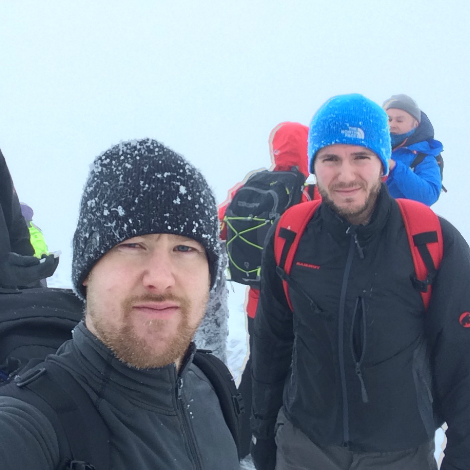 We’re pleased to say Sean is returning to do his third winter with Reach4thealps. He is no stranger to the tourist industry and looking after clients having worked for many years in Fuertaventura as a resort representative. He is a colourful character and has had many interesting hobbies and jobs, from taming sea lions to getting his pilots licence, to a passion for restoring vintage cars. Sean has got many a tale to tell (which will no doubt help pass the time in the transfer van between Morzine and Geneva) and is always smiling. We can’t wait to welcome him back for winter 2018/19. 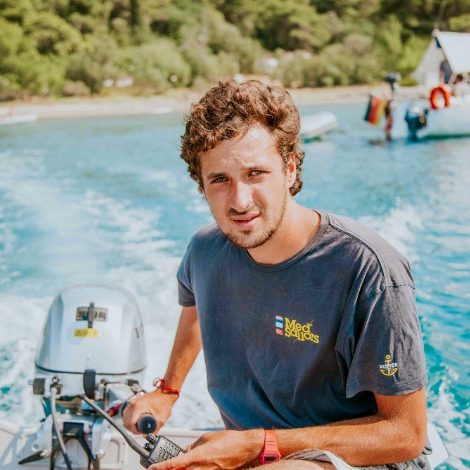 Otto has been in the sailing industry for over 4 years accumulating over 20,000 nautical miles from racing to charter skippering, therefor he is very familiar to the hospitality industry, he is joining Reachforthealps as he is a keen cook and a keen skier. The outdoors is his passion. And he loves the seasonal way of life! Tal has been working in various roles within the mechanical and engineering industry for the past 10 years. Last year, after re-evaluating his life and direction he sold his business and now here he is in the mountains. He has a great passion for the outdoors and adventure. Finding physical and mental limits must clearly excites him as he has competed in ultra marathons, winning his first ever event. Tal is putting his years of experience in motorsport and driving logistics to good use here in the alps as part of the driving and maintenance team. The lovely Amelia is back! Last year she was a top host at Chalet Alouette in Les Gets and this year she’s being equally fantastic helping at Chalets Hibou and Chouette. She’s busy helping cook delicious food and drive our guests around resort and we’re really happy to have her back. After 5 years of living and working abroad, staying everywhere from Italy to Mexico, Aimee gained lots of experience in customer service. In 2014 she moved back to the UK to experience a “proper job” but could never fully resist the call of the mountains. Having worked 2 previous seasons as a Chalet Host, Aimee will be joining Reach4theAlps to share her cleaning and culinary skills once again. Having worked in the action sports industry Tash spent her days traveling ski resorts from Morzine to Verbier. However, just marketing the slopes from behind a city desk wasn’t enough for her and eventually the fresh powder of the mountains called. She knew she had to experience living on the mountains everyday. Coupling her passion for baking Tash decided to join her two biggest loves together to cook & snowboard everyday… who doesn’t love a cupcake on the slopes? Caroline and Pat have given up their day jobs in team management and development and spent the summer travelling in Scandinavia. They enjoy spending time in the natural environment, particularly hiking, canoeing, and camping. 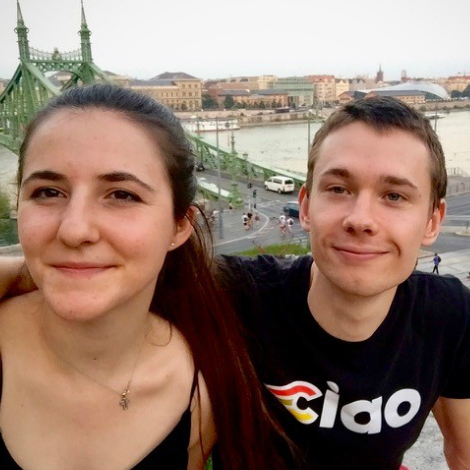 They love meeting people and sharing experiences, so have been doing workaway during their travels, which featured rounding up sheep on a mountain in Norway and helping out on a petting farm in Denmark. Caroline and Pat have skied in many parts of the world and particularly love the variety and extensive terrain of the Porte de Soleil. They are very much looking forward to looking after our guests in Chalet Aux Joux.